Huronia Chapter - Ontario Archaeological Society: Centimetres matter but miles don’t seem to count. When it comes to the science of archaeology centimetres matter when it come to charting the specific location, depth and possioning of one artefact with another. This precision helps to identify things like how old the site is, what else was happening on the site at any given time and where the population spent their time occupied in various pursuits. When digging squares an archaeologist will dig down in levels and layers charting, photographing and recording as they go. They will chart, photograph and record the profile of each square’s wall and draw the different strata of soil layers that they come across. Within this data record they will identify the location of all finds from that of a rock to perhaps a complete pipe. This process is both difficult and time consuming because not only does all this information have to be recorded but then it has to be analyzed and eventually a report written and filed that outlines the procedures, tools, method, and people involved with a conclusion drawn as to what this find may mean. This painstaking process is absolutely essential if we are to maintain a useful record of our past based on the material culture left behind by those who have resided on this land before us. Without this record all we would have is a bunch of collections of curious items found be farmers and others as they walked the fields and woods where previous cultures lived. Archaeology if nothing else is a destructive science that removes objects from the ground and erases all traces of history unless these meticulous centimetre by centimetre records are kept. When it comes to history however both our written record and stories passed on from generation to generation seem for the most part to be far less specific when it come to recording the exact location of any given place or event. In Huronia we have some of the best or at least most voluminous record of time and place of first contact of anywhere in North America. We have the writings of Champlain and his sojourn through here in 1615-16, we have Sagard’s record of his say here in 1623-24 and we have volumes of works from the Jesuits written during their 15 or more years spent amongst the Huron. Unfortunately, although Champlain was a cartographer he left us no map and his instruments of measurement were not as accurate as one might like. Like Champlain, Sagard left us no map and was even vague as to where he spent his time. The Jesuits were the first to attempt to leave maps and gave us numerous point to point or village to village distances but compass vectors are not given and like Champlain and Sagard they gave most of their distances in leagues, not statute miles or kilometres. The length of the league that was used is a subject of debate and can range anywhere from 2.5 to 3 miles depending on which historian you talk to. History records the time and place of events while archaeology is the forensic science that seeks out the material evidence left behind after an event in a particular place. The historical record is better at telling us the what, archaeology the where. It is evident that these two disciplines must be closely aliened if the record of the human past is to be accurately understood. Unfortunately this is not always the case. In some cases the historians have rushed to judgment and proclaims a place to be THE place with no empirical evidence. In many others it is evident that archaeologists have acted in haste on the skimpy evidence they have acquired and meticulously researched and put names and events to places that do not hold up to the historical record. Case in point (one of many) – There is a road sign on Hwy 12 not very far west of Warminster that reads Cahiague. This was the name of the Huron village where Champlain was hosted while awaiting the arrival of the warriors that he was to accompany on their way to fight the Iroquois of upper New York State. At the base of the road and some distance into the woods is an archaeological site that was worked by the archaeological students of the University of Toronto as well as many others for many years. The archaeologist found evidence of some 60 longhouses in what was apparently two villages some little distance apart. 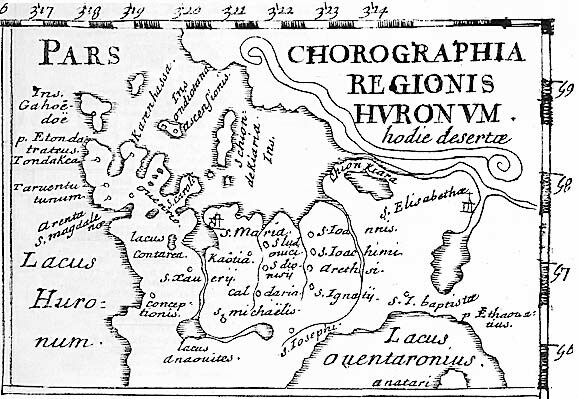 Champlain writes of a large village of some 200 longhouses. The archaeologists have dated this site to the time of Champlain. Champlain says that there were 18 villages in Huronia at his time hence dating alone can not be used to validate this site as that of Cahiague and the size does not match what Champlain recorded as what he saw. Champlain does say that this village was 3 leagues from the Narrows where a large lake (Simcoe) empties into a small one (Couchiching) at Orillia. Cahiague Rd is over 18 kilometres from the Narrows. Champlain says that on his way to the Narrows he followed along the shore of a small lake (Couchiching). The only lake between Cahiague Rd and the Narrows is Bass Lake and it does not connect in any way with a larger lake. One of the early archaeologists to work at the site claimed that it was exactly 9 miles from Orillia. He was correct but only if measured from the western limits of Orillia (Coldwater Rd and Hwy 11). The Narrows is a considerable distance further east at the other side of Orillia. To walk within site of Lake Couchiching to the Narrows one is walking in a southerly direction. From Cahiague Rd to the Narrows one is travelling east. Other than the meticulous work done to date the artefacts found near Cahiague Rd there is no evidence to support this location as the Cahiague of Champlain. It neither fits the description given by him nor the proximity of that village relative to the small lake he describes. All the attention given to the archaeological “discovery” of Cahiague has diverted any other efforts to find or archaeologically verify other potential candidate sites that may well better fulfill the description of the historical record. In the case of the Cahiague Rd site centimetres trumped miles in verification of what is now a Provincially designated historic site and the public is reminded of where this historical site is each time they pass the road sign. With the efforts of the Huronia Chapter this search has been renewed. In its attempt to identify the site visited by Brule in 1610 it has come across a site that seems to better satisfy the historical record for Champlain’s Cahiague. This site has yet to be thoroughly explored by archaeologists and it is our hope that we can build a sufficient case to enable this exploration to happen. If you wish to know where this candidate site is and you are interested in putting “Cahiague research” miles ahead of where it is now we invite you to come to our May meeting where this will be the subject of discussion. I was wondering about a water supply for that "high ground view" location for the village site, but after checking Google Earth, it seems there is a small lake or large pond with a creek feeding into it located a little east and south down the slope to Couchiching. re water supply for the village. When I look at the county map that has a layer showing the streams and swamp areas, there appear to be numerous streams issuing from the east side of the ridge that flow into Lake Couchiching. I suspect that this village (if there was one)fronted on the eastern edge of this plateau just above the trail.